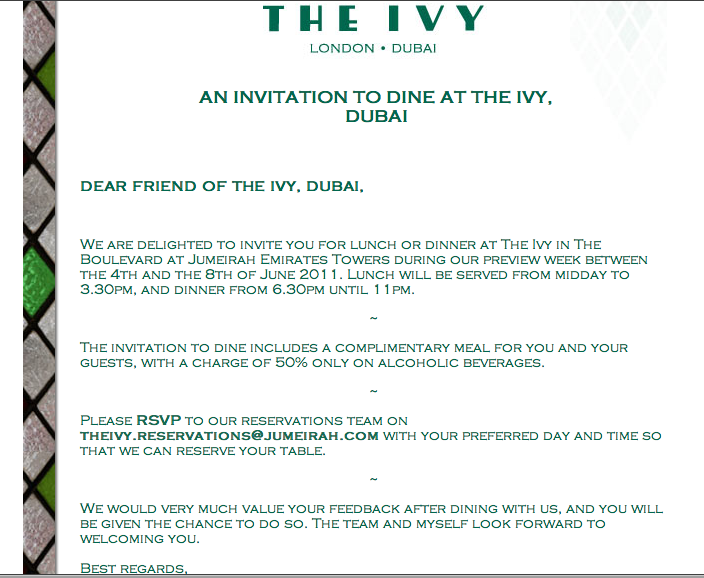 Yesterday evening was the Opening of the Ivy. It was a lovely evening. The place is very sober, I loved the wooden walls and the subdued lighting. 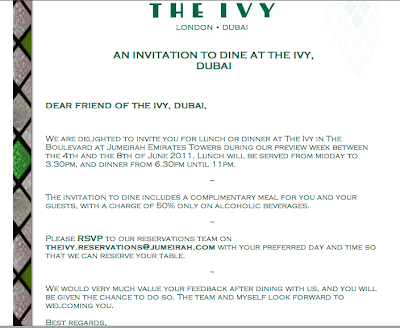 It looks like a Brasserie in the english Style, a Peace Haven in Dubai's shining World. The Staff was very welcoming and kept on apologizing for the missing Art Work and Tablecloths, they looked quite embarassed. But they turned a little delay into a good marketing argument: another reason to come back later. The service was a bit slow, probably because it was the first evening and the place was quite noisey so it is a good thing they spared us the Music. I am pretty sure it would be lovely on a regular night. The Food was simple but good. Lots of traditionnal comfort Food. Nothing new or experimental but tastey homley Food. The "Bang Bang"chicken is a classic Chicken Thai Noodles dish, for the main course, I would go for Pasta or Fish as the friends who had Meat were a little bit disappointed (you can't fool an American when it comes to Meat), and of course, like last time, I highly recommand the Sticky Toffee Pudding, even if the Lemon Tart was tasty, not too sweet, a real Delight too. To conclude I would say they still need a little bit of training but it is a nice place for a quiet intimate dinner.